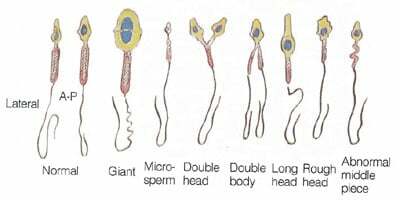 Sperm morphology is a term used to describe the appearance (shape and size) of sperm. The shape of sperm is a reflection of proper sperm development (spermatogenesis) in the testicles. Men with defective sperm production may produce a high percentage of abnormal sperm. There are many factors that can lead to the formation of sperm with an abnormal morphology. Genetic traits, exposure to toxic chemicals, increased testicular temperature and infection can cause abnormal sperm morphology. The most common cause is attributed to abnormal morphology (shape). Poor sperm development can lead to teratospermia (also known as abnormal sperm morphology or poor shape) a condition characterized by the presence of a large percentage of sperm with abnormal shape in a man’s ejaculate. This abnormal sperm morphology can negatively impact the chances of conception. If you are looking for treatment for poor sperm morphology or how to improve your sperm morphology, be sure to see a specialist. Visit Dr. Matin Bastuba and the caring staff of Male Fertility & Sexual Medicine Specialists™ in San Diego, California. Contact us today! How is Kruger Strict Morphology Performed? A proper Kruger Strict Morphology(KSM) is performed by a well trained laboratory technician critically looking at 300 sperm. Each of those 300 sperm are held up to an archetypal "perfect sperm" shape to see if they exactly match the perfect shape of that archetypal sperm. If there is any deviation from perfect, then that sperm is said to be abnormally shaped. As you can see, we are only looking at 300 sperm of the many millions that could be in any given sample. However, the original data as presented by Dr. Kruger supported the idea that better shaped sperm had a greater likelihood of creating pregnancies. It's suggested that when Kruger strict morphology was abnormal that IVF may produce better fertility outcomes. As of 2010 the World Health Organization accepted the Kruger Strict Morphology as the preferred method of evaluating sperm shape. The WHO Laboratory Manual currently states that a morphology score of 4% or better is acceptable (the lower reference limit).